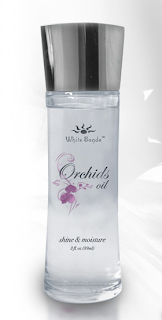 White Sands Orchid Oil gives new meaning to "fresh flowers for your hair." Contains orchid oil extract that aids in the return of moisture, softness and shine that is damaged for heat styling, chemical hair treatments and UV exposure. Also helps to repair split ends and heal cuticle layers. I love the smell! It smells so good. Even after one application I noticed a difference in my hair. It can be a little difficult to get out the bottle but I absolutely LOVE it. Relatively inexpensive at $20 for 3oz your hair will thank you and smell like fresh flowers from Hawaii. oooh!! oooooh! I need stuff like this for my hair! I wanna smell like Hawaii! Mmmmm sounds good! definitely gonna give this a try! Sounds really good, I want some in my life.